A cavalry soldier in full parade armour was a magnificent sight. The spectacular quality of the equipment reflected the supreme standing of the Roman cavalry. Cavalry helmets were particularly striking. Some came with facemasks. These were used during parades and ceremonies but may have also been worn in battle. Fully masked cavalrymen would have terrified the enemy. Their fearless expressions would have emphasized the power and might of the Roman Army. 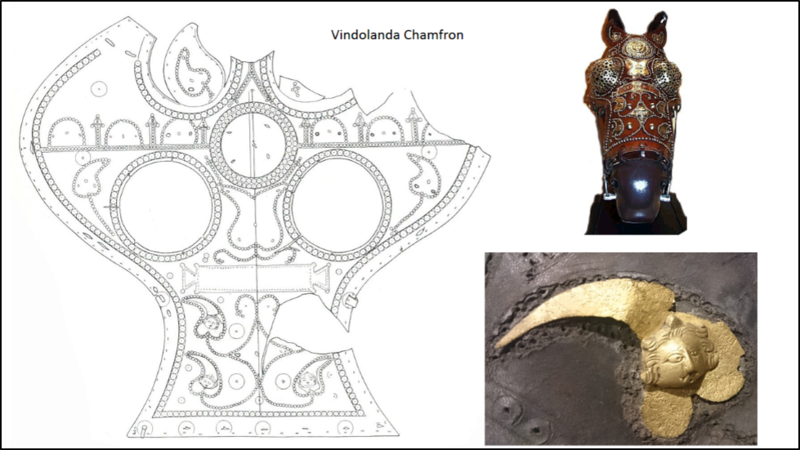 Parade armour was often decorated with motifs such as animals, gods and mythical figures. These held special meanings for cavalrymen and tell us about their superstitions and beliefs. In 2006 excavations in the south-east corner of the fort at South Shields uncovered some large fragments of corroded iron. After X-ray and cleaning they were revealed to be pieces of an iron cavalry helmet. It had embossed decoration, including curls of hair and ribbons. The ribbons suggest they might come from a helmet depicting a female face. They were found behind a barrack used by cavalry soldiers. A new workshop had been built against the fort wall. The helmet fragments came from a levelling layer under the street between the barrack and workshop. They were deposited sometime between AD 165 and AD 190. It is a rare example of a cavalry helmet found inside a fort in a well-dated context and close to a known cavalry barrack. Nine chamfrons or horse's head armour, which may have been ceremonial, have been found at Vindolanda. The most complete example was found in 1987. It is made of cowhide with goat skin lining and is about 4-5mm thick. Most of the studded decorations have not survived or were removed in Roman times. A large round phalera (metal disc) was fixed to the forehead and a separate panel, presumably with name of horse, rider and unit, has been lost. On this example three of the small foil attachments in copper alloy survive. They are in the shape of ivy leaves with faces of Bacchus. One is missing. It may have been used as a mould for new attachment. The Vindolanda chamfrons show that the useful material was salvaged before they were discarded. There's a possibility they made new equipment. These objects would have been made to measure. The plan below of the Commanding officer's house dates to AD 100-105. It marks where the chamfron was found. It also shows the location of partial chamfron and chamfron offcuts. This provides substantial evidence that this is the building where chamfrons were worked on and made. Found near to this almost complete chamfron was an offcut inscribed with ‘promised to Veledius’. 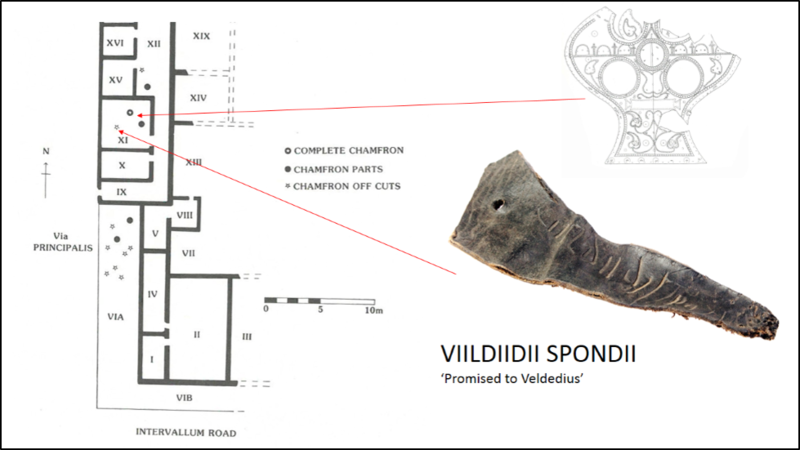 One of the Vindolanda tablets mentions Veldedius. 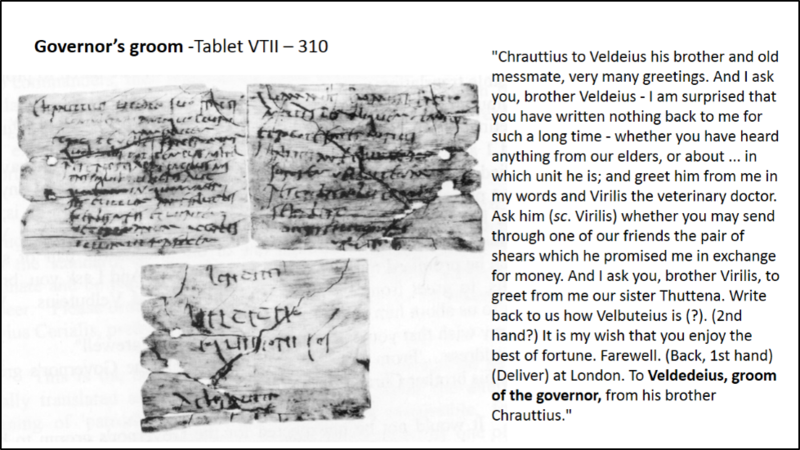 This tablet from Chrauttius to Veldedius is addressed to the ‘groom to the governor’ at Vindolanda. This could be the literal groom or more likely the governor’s special messenger or personal guard. We know from other tablets that the governor of Britain came to Vindolanda and stayed with Cerialis. It is likely that Veldedius was there around the same time. Could the chamfron belong to Veledius, the governor’s groom? "When I train on the parade ground I wear full armour including my helmet and facemask to practice my battle moves. My mask makes me feel powerful and scares my enemies."